In this issue we are going to examine “Live or Dynamic Storage”: What it is and how it is used to improve orderpicking efficiency. We will also examine how you select the right system for your operation. Orderpicking is one of the most important functions within a warehouse. It is the means of getting the right product out of the storage system and to a customer. Live storage systems are used to improve the efficiency of the orderpicking operation. Orderpicking operations can be divided into two basic types: Those where the picker moves to the product and those where the product moves to the picker. For both these systems, the picker may pick an entire order or multiple orders at the same time. Live storage systems can be supplied for use with pallets, cartons and tote boxes. Those designed for cartons and tote bins are primarily used in orderpicking systems where the product is presented to the picker. Pallet live storage systems tend to be used where the picker moves to the product. Live storage offers highstorage density and first-in first-out stock rotation. 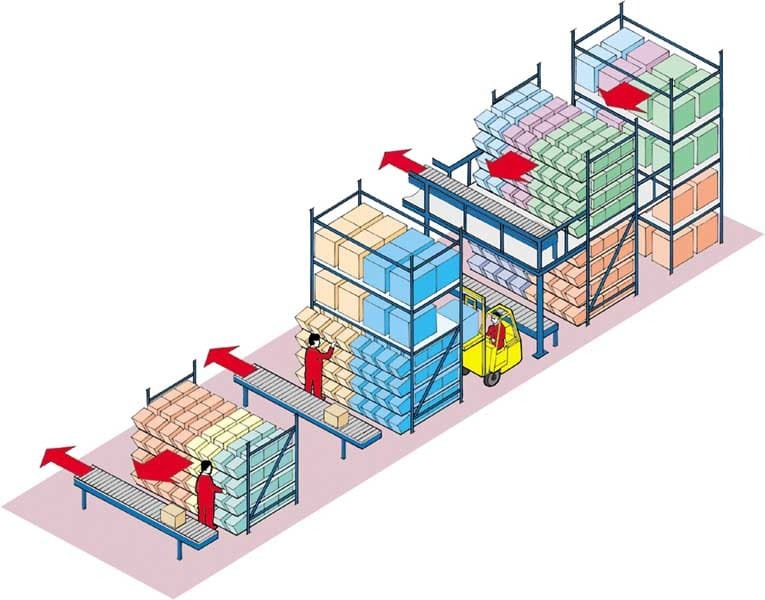 Product enters the storage system from one aisle and exits from another aisle or via a conveyor system. In all cases each container is supported so storage quality is excellent. Speed of throughput is high as the goods are presented to the picker, and order picking errors are minimised as each product line will have a dedicated lane. The term live storage comes from the fact that the system will replace product picked without intervention by the picker. Live storage works using roller tracks mounted within a standard pallet racking framework. The roller tracks aremounted on an incline, with product being loaded at the back, moving down the incline under the force of gravity, to the picking face. The picker can work unhindered at the picking face while product replenishment from the bulk store takes place in the replenishment aisle. The most widely used live storage systems work with cartons and have stock replenishment at the rear of the system by product bought from bulk storage. Utilising the versatility of the pallet racking framework the carton live storage could be replenished from product stored above on pallets. High density picking areas can be constructed using a mezzanine floor and installing two tiers of carton live storage within the racking frame. Replenishment is direct from the palletracking which also forms part of the mezzanine structure. See the illustration which shows each type of layout. Redirack’s pallet racking frame construction allows for a roller bed width of up to 3 metres, and a depth of 5.3 metres. Roller tracks can be adjusted in 10.5mm increments across the width of the picking face. In practise we have found that this caters for 99% of all carton and tote bin configurations. To assess the best systems and methods for your company you will need to examine your operation: The types of product you are handling, number of product lines, quantity per pick, inventory levels, order volumes, and the target turnaround time from order to despatch. This information will be required by your supplier to enable them to specify and design the various solutions to your problem. For example the number of product lines you carry will dictate the size of the livestorage system. However, not all your lines will be fast moving and need to be included in the live storage area. But does your fastest moving product require more than one lane? There will be more than one optimal solution for your business, and theavailability of automated control systems and pick-to-light systems makes the choices more difficult. In a future column we will examine how the various criteria influence the design of the systems and what dictates the system you choose. If in the meantime you require further information call and ask for our Carton Live Storage picking system brochure.